Last month we reached out to our global family of supporters to let you know about nuns working hard to become Geshemas. So many of you wrote to share beautiful good luck messages for the Geshema candidates. We compiled all your good luck messages and they were posted on the noticeboard at Dolma Ling Nunnery. Our wonderful Nuns’ Media Team documented the nuns reading the messages and also the start of the 2018 Geshema exams. We’d like to share some of the photos and some of your good wishes here, taking you on an armchair trip to the heart of Dolma Ling Nunnery. Nuns gather at the Dolma Ling Nunnery bulletin board to read the many messages of good luck sent to the Geshema candidates. Photo by the Nuns’ Media Team. In August 2018, 44 Tibetan Buddhist nuns are sitting various levels of the rigorous four-year Geshema exams. (Earlier we reported that there were 46 nuns, but one of the nuns taking first-year exams had to postpone and return home to care for her ailing mother, and one of the second-year nuns also had to miss exams this year) The written and oral (debate) exams run from August 15-26, 2018. 10 nuns doing their fourth and final year. A smiling Tibetan Buddhist nun enters her Geshema exams equipped with ruler and pens. The written and oral exams last two weeks and are based on 17 years of study. Photo by the Nuns’ Media Team. The Geshema degree (or Geshe degree for monks) is roughly equivalent to a PhD in Tibetan Buddhism. This highest degree was, until recently, only open to men. Now Tibetan Buddhist nuns are making history. In the last two years, 26 Tibetan Buddhist nuns have earned this degree. Supporters from around the world sent heartfelt messages of good luck to the nuns taking this year’s Geshema exams. The messages were posted on the bulletin board at Dolma Ling Nunnery for all the nuns to see. Photo by the Nuns’ Media Team. Introductory remarks and good wishes before the 46 nuns start taking their two weeks of Geshema exams. Photo by the Nuns’ Media Team. In the spring of 2018, we launched a special fund for the 2018 Geshema Exams. We are extremely grateful to all the donors who made gifts to this fund which is being used to cover the costs of travel for the nuns to and from their exams and for the food during their month-long stay at Dolma Ling. We’d like to say a special thank you to Vita Wells who made a major gift to this fund in memory of her late partner, Michelle Bertho. We would also like to send a special thank you to Dechen Tsering for launching a birthday campaign for this fund and to her many friends and family who made gifts in her honor. Each year, the two weeks of Geshema exams involve both written exams and oral (debate) exams. 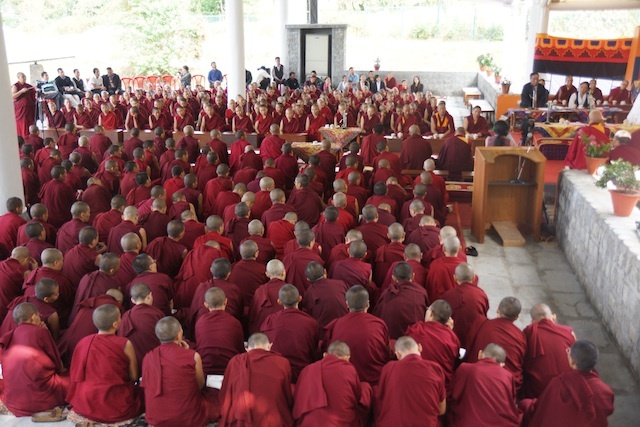 Nuns must complete 4 years of exams to earn their Geshema degree, equivalent to the Geshe degree for monks. Photo by the Nuns’ Media Team. We are still seeking $2,035 to complete the funding for the 2018 Geshema exams. You can learn more and donate here. All prepared and entering the exam hall. Photo by the Nuns’ Media Team. Nuns cluster around the noticeboard at Dolma Ling Nunnery to read the good luck messages for the Geshema candidates. The good wishes were felt by all the nuns. Photo by the Nuns’ Media Team. The Geshemas are paving the way for other nuns to follow in their footsteps. This degree will make them eligible to assume various leadership roles in their monastic and lay communities reserved for degree holders and hence previously not open to women. The 26 Geshemas who graduated in 2016 and 2017 are now taking part in a groundbreaking new Buddhist tantric studies program. This two-year program at Dolma Ling Nunnery started in November 2017 and is funded by generous supporters through the Tibetan Nuns Project. A nun debates as part of her Geshema exams. Providing opportunities for the nuns to debate has been a critical part of their education to reach this highest degree. The next major event for the nuns is the annual inter-nunnery debate, called the Jang Gonchoe, which will take place this year at Kopan Nunnery in Nepal. This entry was posted in Geshema, Geshema examinations, News and Updates, Uncategorized and tagged Dolma Ling, education, Geshema, Geshema degree, Geshema exams on August 17, 2018 by Tibetan Nuns Project. The most important month in the Tibetan lunar calendar is Saga Dawa, the 4th month. This year Saga Dawa starts on May 26th 2017 and runs until June 24. The 15th day of this lunar month, the full moon day, is called Saga Dawa Düchen. Düchen means “great occasion” and this day is the single most holy day of the year for Buddhists. This year, Saga Dawa Düchen falls on June 9, 2017. Saga Dawa Düchen commemorates the birth, enlightenment, and parinirvana of Buddha Shakyamuni. In other Buddhist traditions it is known as Vesak or is sometimes called Buddha Day. This entry was posted in Buddhist Nunneries, Events and tagged Dolma Ling, Saga Dawa, Saga Dawa Duchen, Tilokpur on May 26, 2017 by Tibetan Nuns Project. 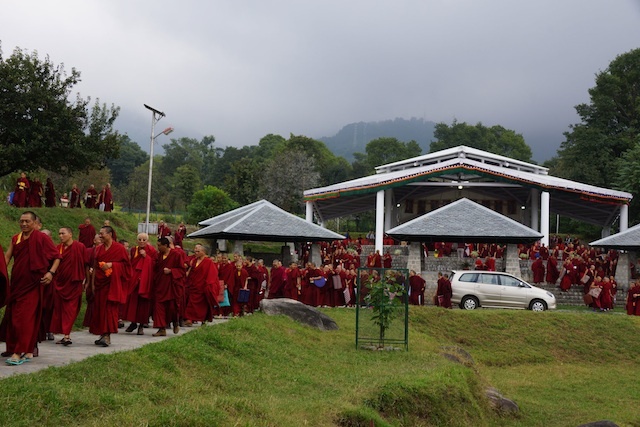 On October 4th, 208 Tibetan Buddhist nuns from 8 nunneries in India and Nepal gathered at Dolma Ling Nunnery and Institute near Dharamsala, India for the start of the month-long Jang Gonchoe debate session. The nuns have just sent the following photographs showing the start of the event. 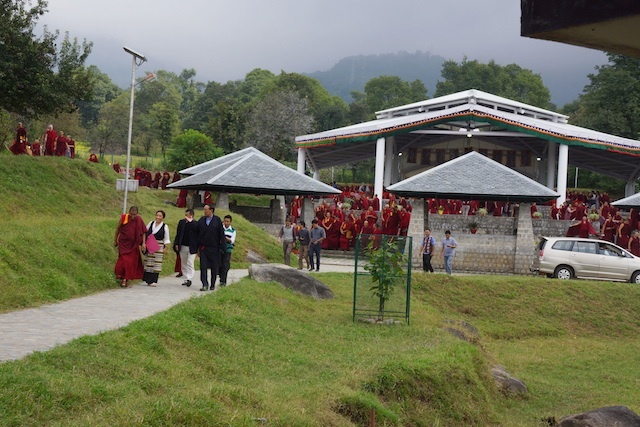 Dolma Ling Nunnery and Institute, near Dharamsala, which is the host nunnery for this year’s annual Jang Gonchoe debate session. 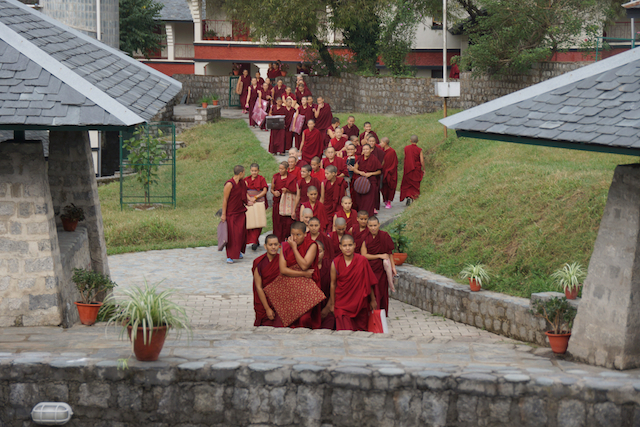 This brings the number of nuns at Dolma Ling Nunnery to over 450 for this very special month-long event. The chief guest for the Jang Gonchoe is Mr. Pema Chonjor, Kalon (Minister) of the Department of Religion for the Tibetan Government. Monastic debate is of critical importance in traditional Tibetan Buddhist learning. Through debate, the nuns test and consolidate their classroom learning with the motivation of ending suffering for all sentient beings. The Jang Gonchoe debate session provides a tremendous opportunity for the nuns to practice this ancient form of learning and for many, it an essential component of working towards their Geshema degree, equivalent to a PhD in Tibetan Buddhism. As you can see from the photos, the debate courtyard at Dolma Ling nunnery is a wonderful space where the nuns can debate year-round, regardless of the weather and the season. The photos clearly show the new metal roof that will protect the nuns from the hot Indian sun, the torrential monsoon rains and the other extreme weather in the region. The Tibetan Nuns Project is extremely grateful to all our supporters who have helped make this event possible through the funding of scholarships to enable nuns to attend, the funding of the creation of the debate courtyard space and also the funders for the debate courtyard roof. The former soft-cover roof for the courtyard was destroyed in extreme weather. 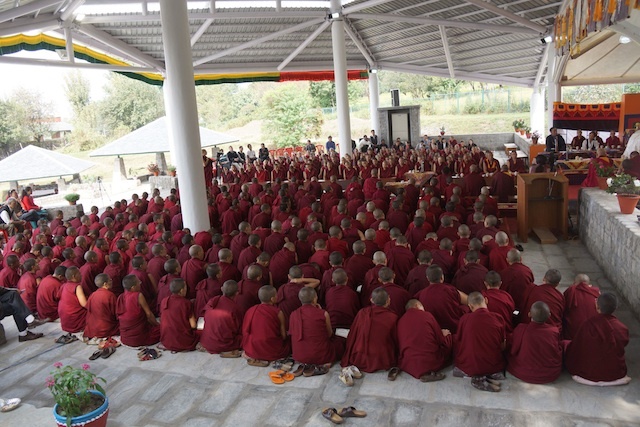 In order to have a new roof in place in time for the start of this event, the Tibetan Nuns Project took out a loan and rushed to create a permanent metal roof for the courtyard. 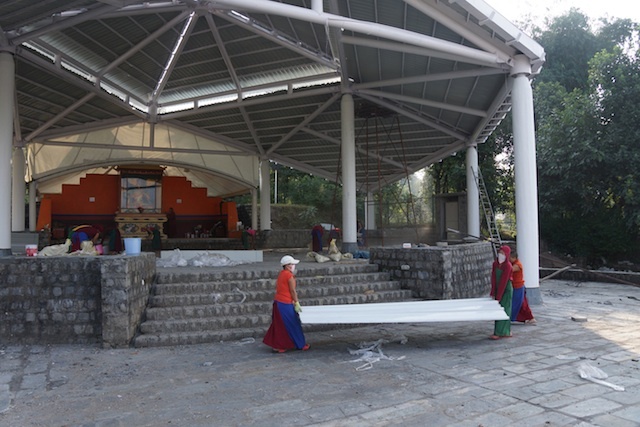 As with all the construction projects at Dolma Ling Nunnery, such as the retreat huts and the roof of the debate courtyard, the nuns themselves work tirelessly. 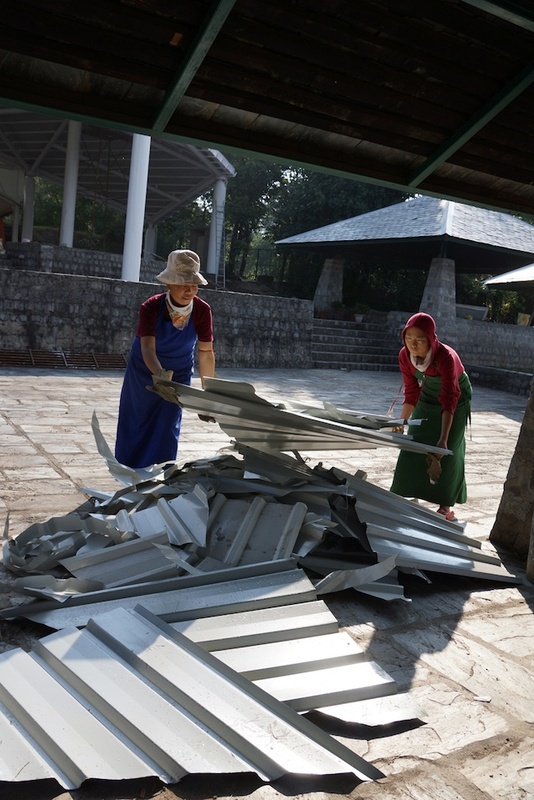 This is one of many photos showing the nuns working to get the new permanent roof ready for the start of the Jang Gonchoe debate session on October 4th. We are still seeking support for both scholarships and the roof fund. 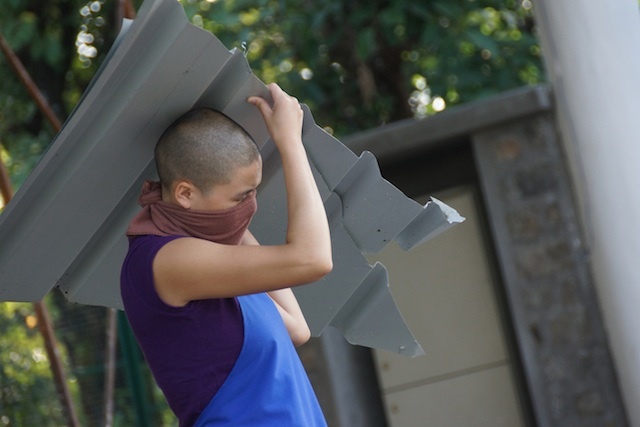 A Tibetan Buddhist nun helps build roof for debate courtyard at Dolma Ling Nunnery. To complete the project in time for the annual debate event, the Tibetan Nuns Project had to take a loan. We are seeking donations to help with our roof fund. The Tibetan Nuns Project was established over 2 decades ago to support a tremendous influx of nuns escaping from Tibet in search of religious and educational freedom. Ranging in age from early teens to mid-80s, they come from all parts of Tibet and from many different backgrounds. Many nuns suffered severely from their long, arduous and often dangerous escape to India. In most cases, the nuns have arrived without money or possessions to a community already struggling to support itself. These women wish nothing more than to live, study, practice, and teach in accordance with their spiritual beliefs. This entry was posted in Buddhist Nuns Life, News and Updates, Nuns education and tagged Buddhism, Buddhist nun, Buddhist nun education, Dharamsala, Dolma Ling, Jang Gonchoe, nun, nuns, Tibet, Tibetan Buddhist nuns, Tibetan debate on October 8, 2013 by Tibetan Nuns Project.